Wreaths are meant to be hung proudly, not squished between the top of a shelf and the ceiling. In this photo, a once-beautiful wreath has been diminished to a decoration with bad posture simply due to bad choice of placement. The better option would have been to hang the wreath over the cabinet door. Learn from the mistake and never place your wreaths in cramped locations. One gust of wind is sure to bring an end to this wreath's hanging days. Autumn is a popular time for outdoor wreath hanging. Unfortunately, it's also one of the windier seasons. Any wreath pro can instantly see that the tiny string fastened to this wreath won't be enough to withstand a big gust of wind. 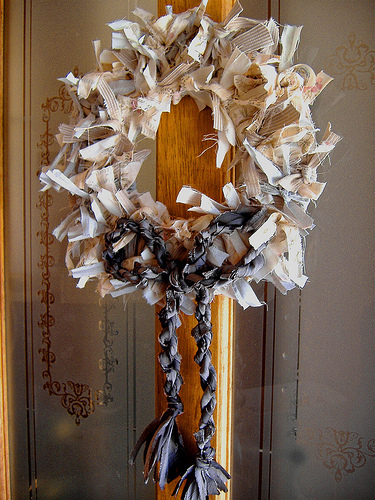 Don't let your hard work spent crafting a beautiful wreath go to waste due to an insecure display. Choose a sturdy and professionally-made wreath hook instead. 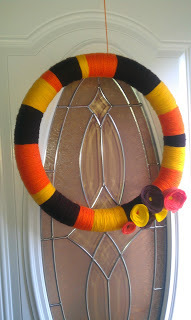 The simple act of opening a door could send this wreath flying. While this wreath is beautiful, it appears to be hanging solely from a door knocker; or, worse yet, fastened to a nail. First, a nail should never be hammered into your door for the sole purpose of hanging a wreath. Second, hanging an outdoor wreath from a nail or door knocker brings the possibility for the decoration to fall off each time the door is opened or closed. With professional wreath hangers available, there's no excuse for insecure wreath hanging. Don't decorate yourself into the inconvenience of not being able to open a door. 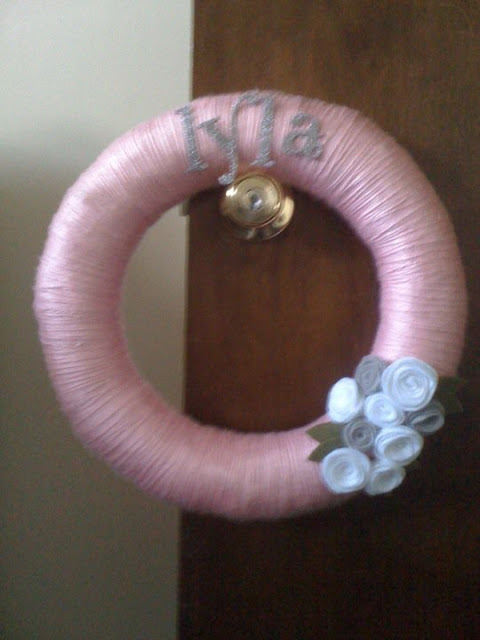 While this wreath for a baby is adorable, it screams of inconvenience. Whether you're closing the door for nap-time or opening it first thing in the morning, each time you reach for the doorknob, the wreath must be removed and then replaced. The better option is to hang the wreath over the door so that it still serves as a gateway into the baby's room without being a hassle. Inconvenience has no place in the vocabulary of wreath hanging. Never choose a hanging location that blocks items you'll be needing soon. Just as a wreath hung on a doorknob blocks your entry, a wreath placed on a cabinet door is sure to bring equal inconvenience. While the fine china in this cabinet may not be used everyday, it's certain to come out of storage for the holidays. 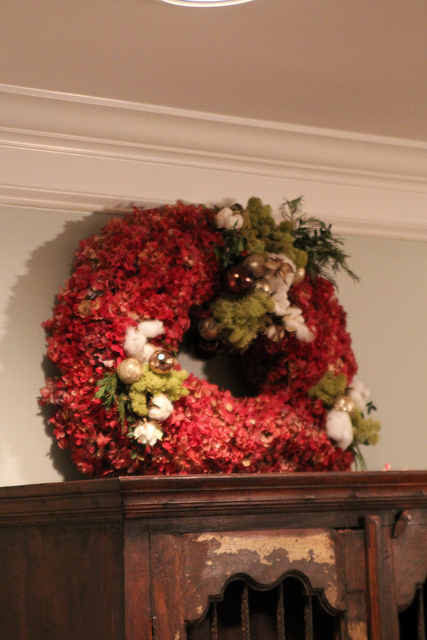 If you want to hang a wreath indoors, position it on a dining room door or securely over the top of a cabinet door. 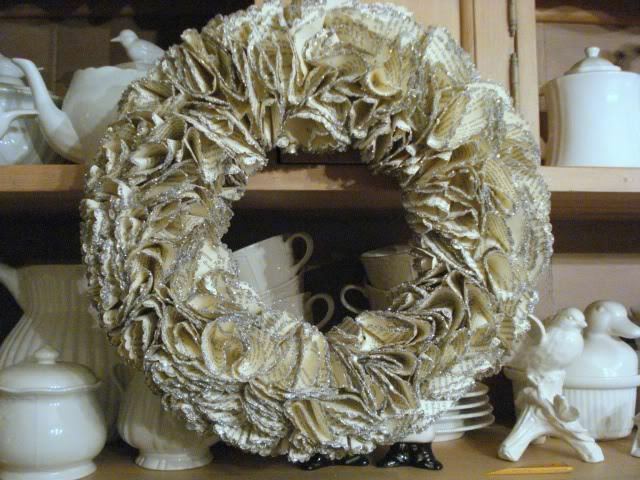 Don’t want your wreath to be the next that appears on a "wreaths gone wrong" blog post? Take some cues of what not to do from these bad examples and then learn the proper and easy way to hang a wreath by visiting Wreath Pro.